After meeting with President Rodrigo Duterte, the wife of Commission on Elections Chair Andres Bautista submitted last week to the National Bureau of Investigation an affidavit, saying that the Comelec chief might have amassed nearly P1 billion worth of ill-gotten wealth. Patricia Paz “Tish” Bautista submitted the affidavit on Aug. 1, five days after she sought an audience with Mr. Duterte in Malacañang to tell him that she had discovered several passbooks as well as bank and real property documents under her husband’s name and some of his relatives that were not included in his 2016 statement of assets, liabilities and net worth (SALN). 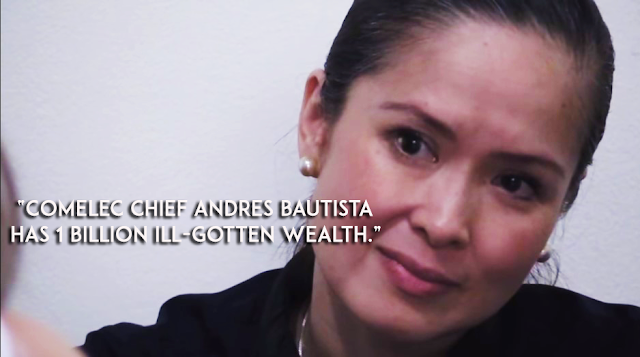 Bautista declared a net worth of P176.3 million in his SALN. “I understand that since Andy holds the position of Comelec chair, he is liable to be impeached should there exist valid and sufficient grounds to hold him in trial for an impeachable offense under Sec. 2, Article XI of the 1987 Philippine Constitution,” Patricia said in the affidavit. Bautista was appointed to the Comelec by then President Benigno Aquino III in May 2015. In 2010, Aquino named Bautista chair of the Presidential Commission on Good Government, the agency tasked with going after the ill-gotten wealth of the late dictator Ferdinand Marcos and his family. Patricia said that except for two adjoining condo units in Pacific Plaza Towers at BGC in Taguig City, the family home, she was not aware of the 13 other real properties listed in her husband’s SALN. Her lawyers said this meant Patricia had no hand in the purchase or acquisition of these properties because her husband always kept her in the dark when it came to their assets. Patricia said in her affidavit that based on her own assessment, the cumulative value of the properties at their acquisition costs was between P250 million and P300 million, “definitely more than P158.5 million” that Bautista declared in his 2016 SALN. • Bauman Enterprises Ltd., a company established in the British Virgin Islands on Sept. 29, 2010; a trustee company that Bautista set up with Bank of Singapore. • Mantova International Ltd., established in Brunei Darussalam on April 26, 2011. • Mega Achieve Inc., established in Anguilla, a British overseas territory in the Caribbean, on July 15, 2014. “I previously confronted Andy about these companies and he bluntly denied that he was involved in any way with any of them. However, it is highly suspicious why he would have copies of pertinent documents relative to such companies when he claims that he does not have any involvement with any of those,” Patricia said in her affidavit. Of the 35 LDB passbooks, Patricia’s name appeared in only one. She told reporters on Friday that she was unaware that she had an LDB passbook. Patricia narrated to reporters her discoveries that she included in her NBI affidavit and the life she had with her husband of 17 years from whom she had been wanting to separate since 2013. She said it was out of “fear” of Bautista and his network that she sought an audience with Mr. Duterte. Patricia has filed a case of violence against women and children with the Taguig City Prosecutor’s Office, accusing her husband of “emotional and economic sabotage” against her and their children. But it still bothered her that she had all the documents that might be proof of misdealing and corrupt practices, she said. Patricia’s lawyers said Bautista could not accuse her of stealing his passbooks and other documents because she found them in their conjugal house. “I am getting scared… I am holding these stuff. I don’t know what it is. I don’t know how far-reaching it is. I don’t know what to do, right?” Patricia said. “So I would think that the safest place to bring this is there (referring to Malacañang), because at the end of the day, this is the President. This is as high as it goes,” she added. Patricia said she was able to arrange a meeting with Mr. Duterte through friends she did not name. They met at the Music Room of the Palace on July 26 for two to three hours. Patricia’s lawyers were present. “I think he was surprised as much as I was,” she said. In the course of their meeting, Patricia said the President summoned NBI Director Dante Gierran to the Palace. Patricia said she executed the affidavit for fear that some of her family’s finances and properties might have been accumulated from “illegal or immoral acts or conduct” during her husband’s time in office. “I want to make a distinction of the ‘clean’ and ‘dirty’ money that forms part of our conjugal property as husband and wife. After all, Andy had worked in the private sector before joining the government and his income from the private sector was substantial as well,” she said. However, she can not make the distinction herself since it is Bautista who “controls most, if not all, of our finances,” she said. She added that her husband knew she had in her possession all the documents she mentioned in her NBI affidavit. “As his reprisal, Andy has purposely cut off any financial support that he has previously given to me and my family, in the hopes that this act would pressure me to give up the documents and information I have against him,” she said.